Samsung launches 2019 QLED TVs. March. 26, 2019 07:34. by Ji-Hyun Kim jhk85@donga.com. Samsung Electronics Co. on Monday launched a full lineup of 8K and 4K QLED TVs in the domestic market. The 2019 lineup is characterized by the reinforcement of the ultra-large-sized models. Samsung applied its artificial-intelligence picture engine dubbed the "Quantum Processor," to 4K models as well as to 8K. Based on machine learning, the Quantum Processor AI analyzes millions of video data to upscales lower-quality content to appear close to 4K or 8K resolution. It also automatically optimizes the sound for each scene and viewing space. The new products are also equipped with the "Wide Viewing Angle-Plus" that features improved viewing angles to create an optimal viewing environment. They also support the HDR10+ standard for premium video quality to provide realistic colors and detailed contrast ratios even in a brightly lighted room or in broad daylight. In addition, the new models feature upgraded anti-glare technology. The "Magic Screen" feature, which is designed to display various content including daily news headlines, weather updates, photos and music even when the TV screen is turned off, offers added content such as world-renowned works of art and background themes that go well with the interiors. 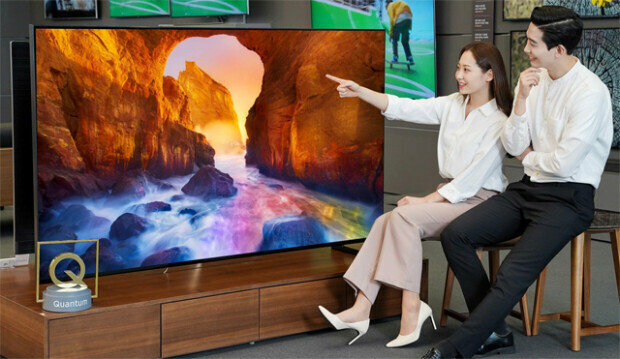 "With the QLED TVs upgraded with improved picture quality and AI, we plan to further solidify our lead in the premium TV market this year," said Choo Jong-seok, executive vice president of Samsung. Samsung offers multiple incentives to customers who buy new QLED models by the end of April, including a five-year warranty, a 10-year warranty for burn-ins, and up to one million won (882 U.S. dollars) in cashback.